Hello friends! 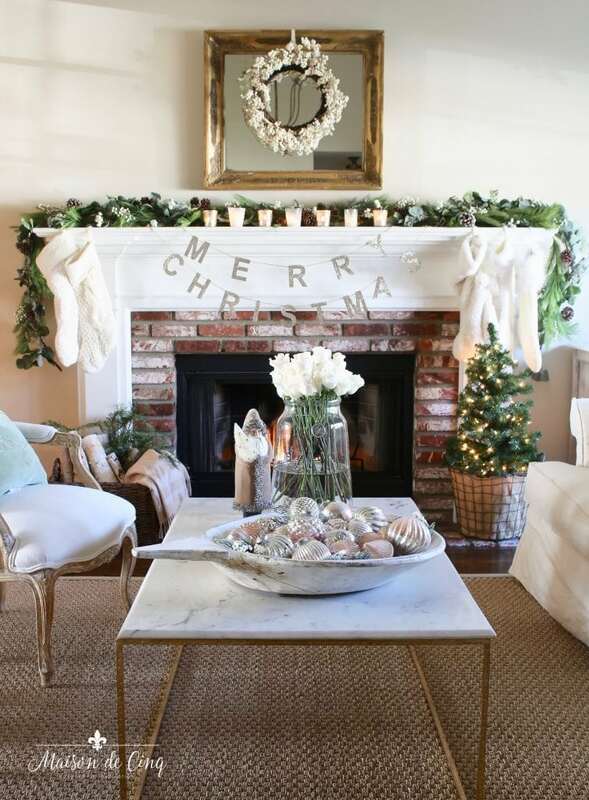 I hope you all had a wonderful Thanksgiving, and are ready to really decorate for Christmas now! 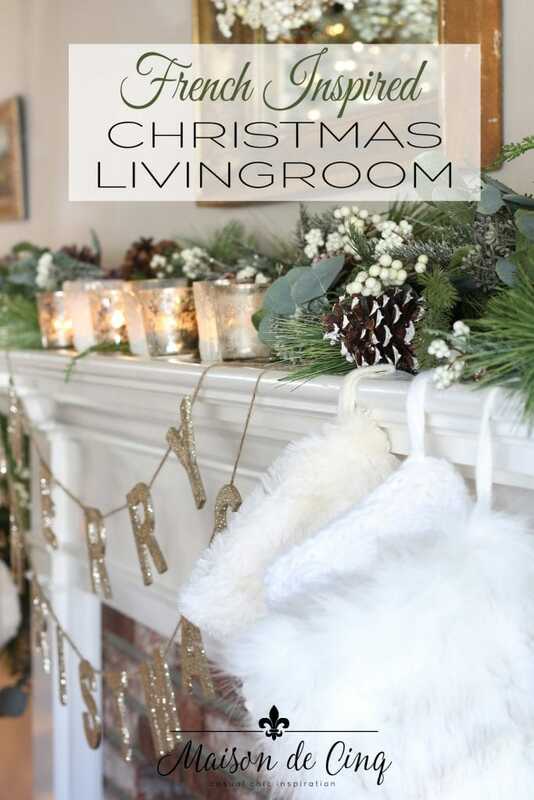 In the last couple of weeks I did share my Christmas kitchen tour and my entry way. However, until the tree is up, it doesn’t really feel like I’ve decorated! The tree is the center of the entire experience for me, and sets the tone for all my decorating. And this year, I have a new one. And I have to say, I’m smitten! 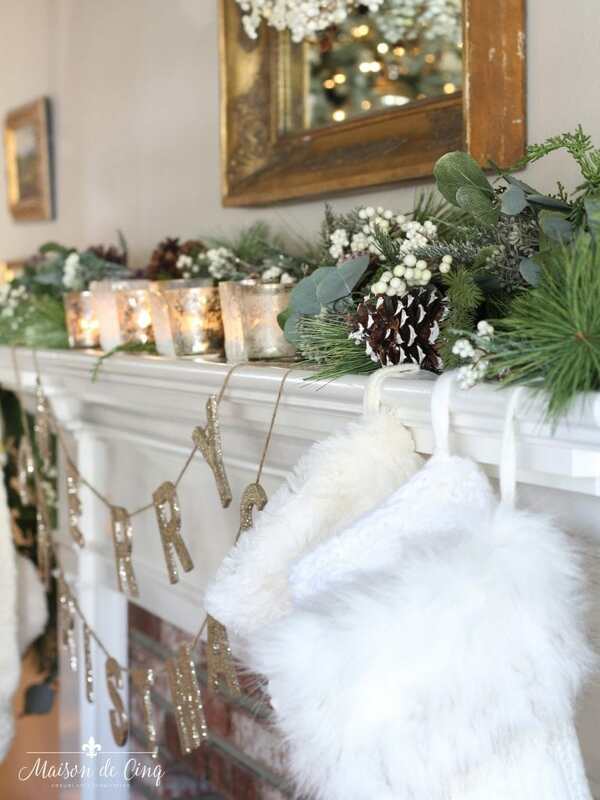 Before I started decorating this year, I had a bit of a plan in my head. It involved my usual neutral French-inspired decor, but with a twist. 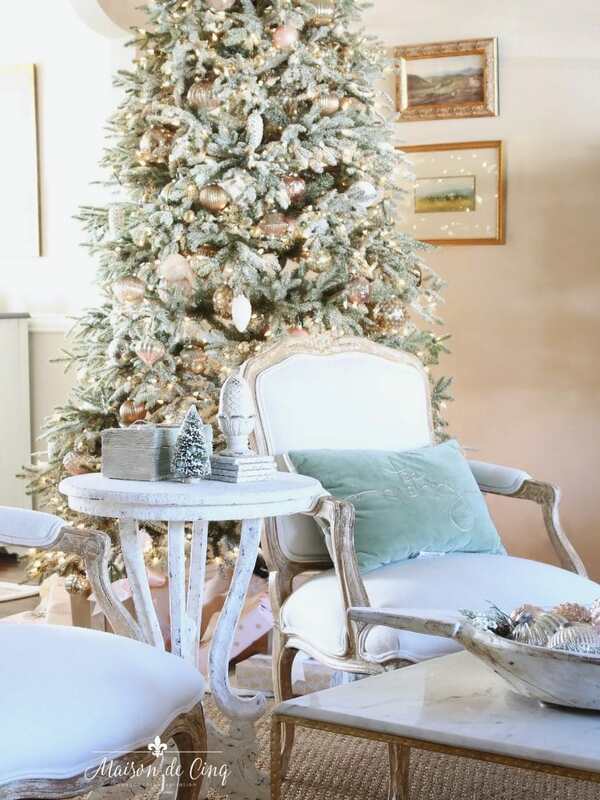 I wanted some blush pink, a lot of white, and a flocked tree. In the past, I had always steered away from the super-white flocked trees. Not that I don’t like them, because I do. I guess because I’m in California, it seemed slightly ridiculous to have a tree that is completely white, haha! 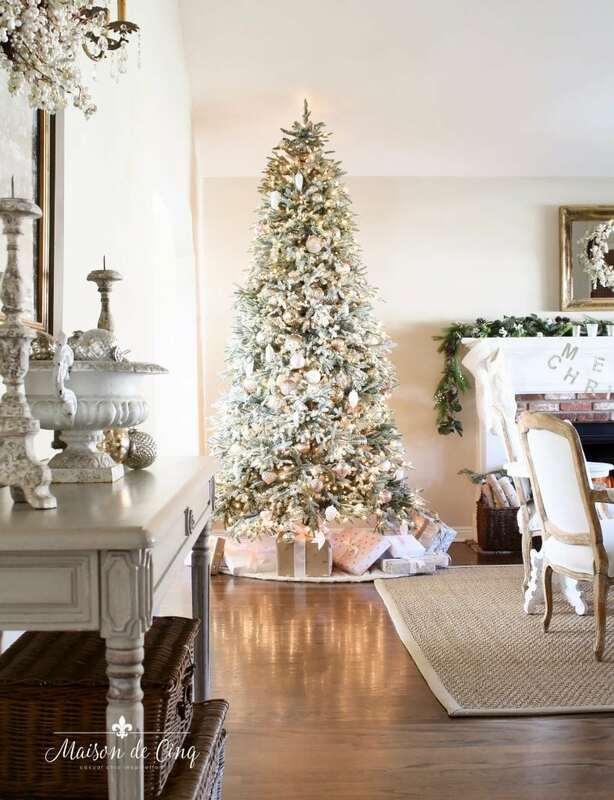 But this Balsam Hill tree is absolutely gorgeous! My Frosted Fraser Fir, is lightly flocked, so it’s not totally white. It’s just enough white to soften the green, and is the exact look I was going for! 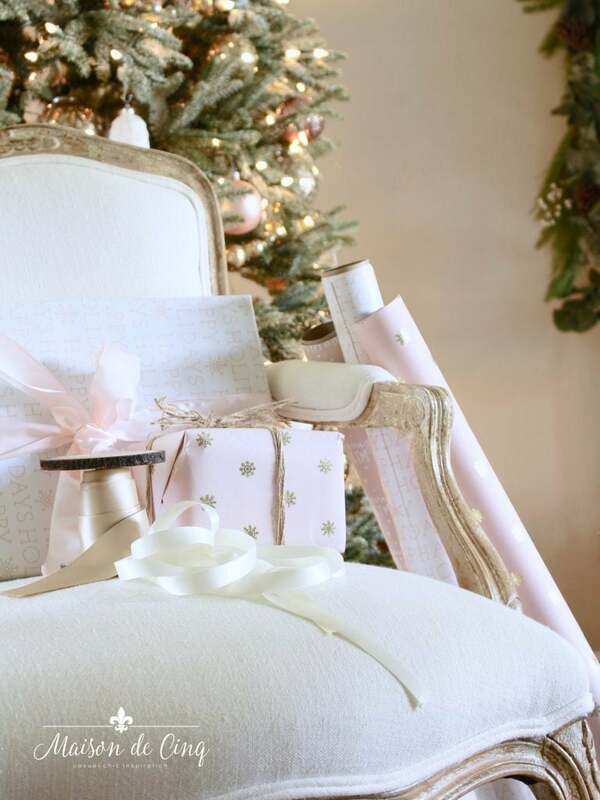 I’m so excited to be a part of the Twelve Bloggers of Christmas Tour, sponsored by Balsam Hill. 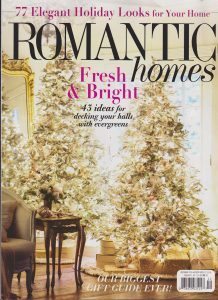 And I’m joining eleven uber-talented bloggers also sharing their trees! So, welcome to my Romantic Christmas Living Room. 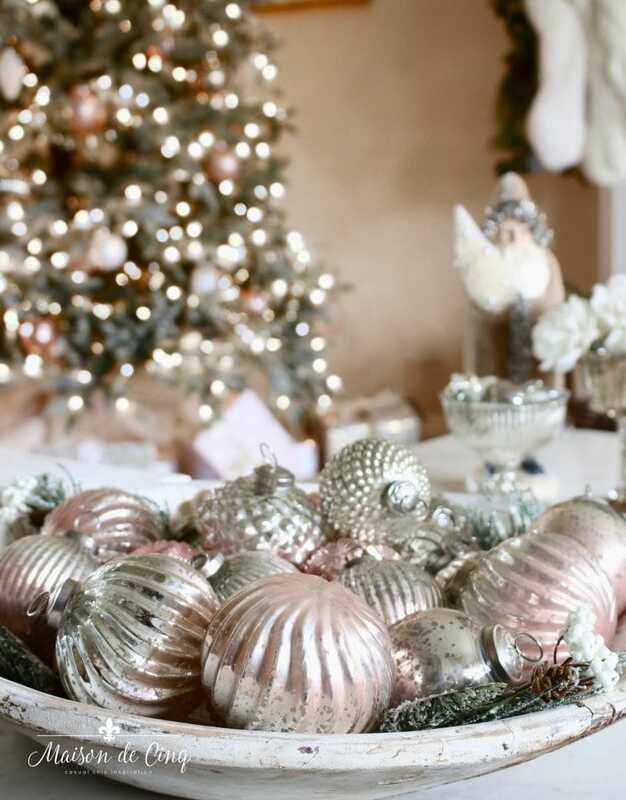 I’m all about the blush pinks, a little bling, and lots of white. The pinks really soften up the whole look, and I love the way it came together…. Previous to being a blogger, I always had a live tree. 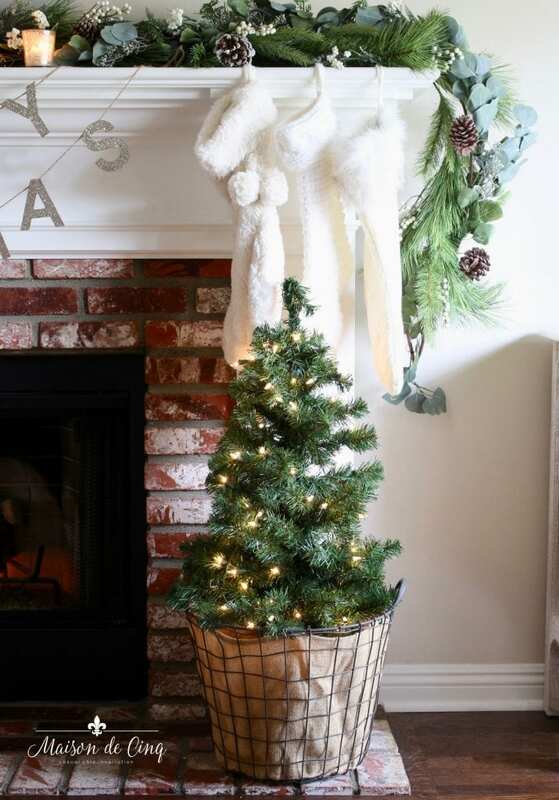 So when it comes to faux trees, I consider myself pretty particular! 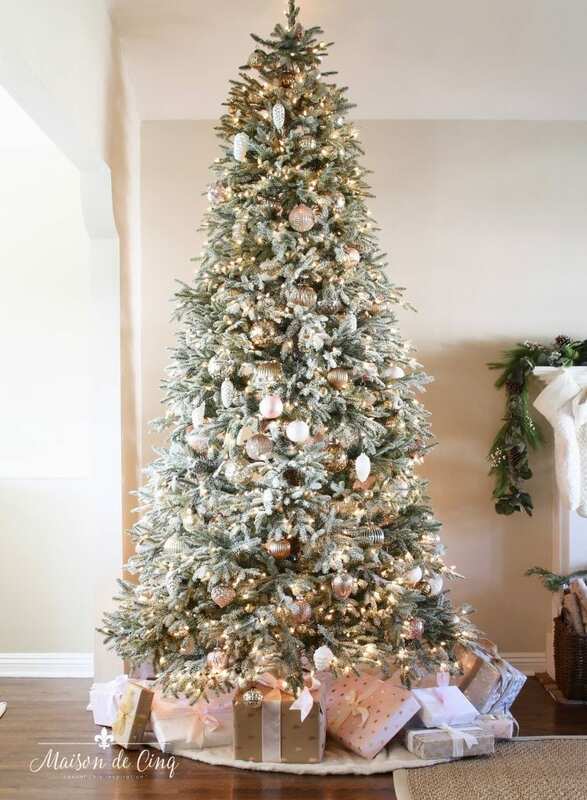 Balsam Hill’s trees are so realistic, and very high quality. And I’m seriously in love with the light flocking – it looks so genuine and is just the right touch. I may never go back to a green tree! 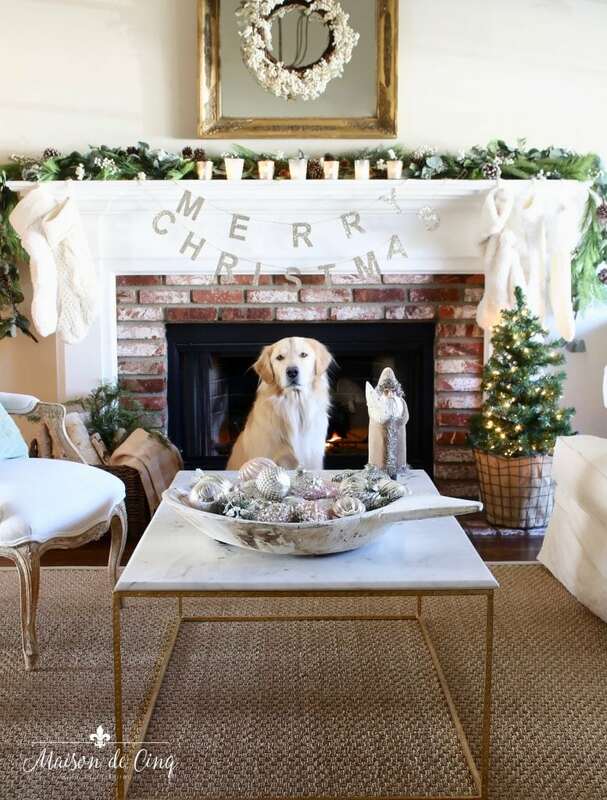 😉 The white faux fur tree skirt is also from Balsam Hill. And of course, because I added the pink ornaments, I had to get some pink wrapping paper! What I love is you can use these all year long! They work for birthdays, showers, or Mother’s Day. On the coffee table I filled an antique bowl with lots of mercury glass ornaments. I mixed some silver ones I already owned with these gorgeous ombre ones from Balsam Hill. 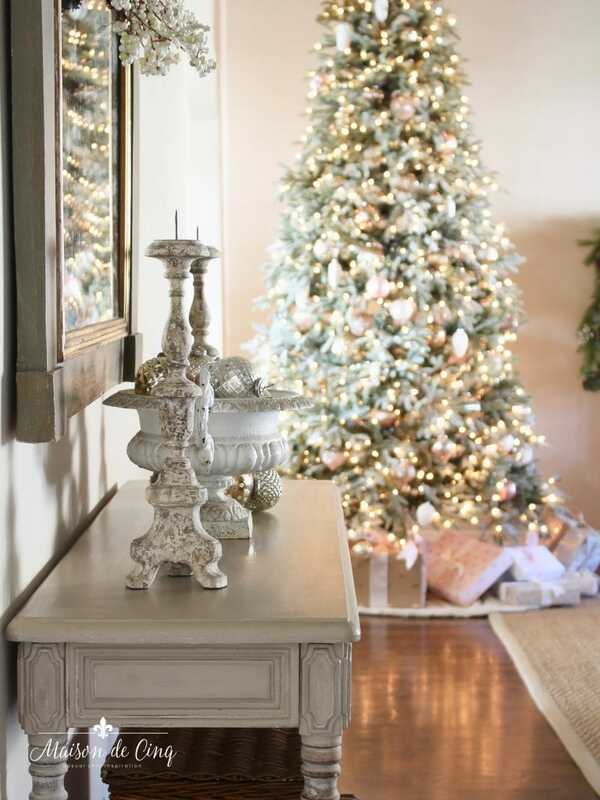 The French Country ornaments look so gorgeous on the tree! 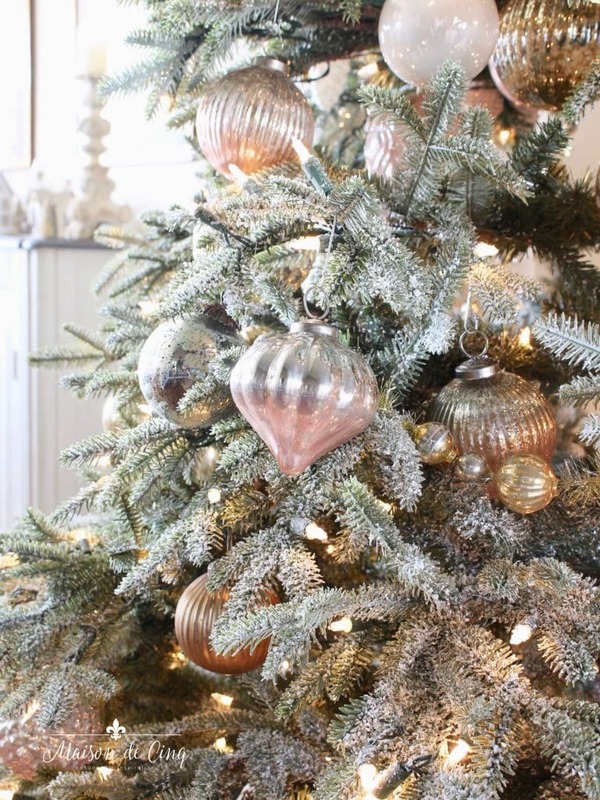 Mixed in with the mercury glass are some pink Winter Wish ornaments and I think they work really well together. And, I also added the Jeweled Christmas Tree Garland for a little more bling. I love that it’s also mercury glass! 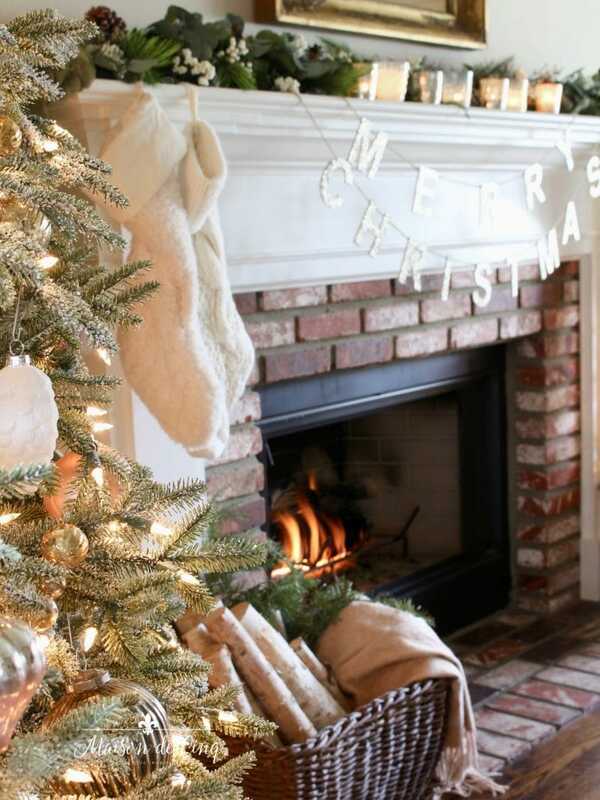 A second little naked tree on the fireplace hearth joins the white knit stockings. These are a mix of some different ones I’ve found, and I’m in love! They have such an old-fashioned charm about them, I think they’re my new favorites! 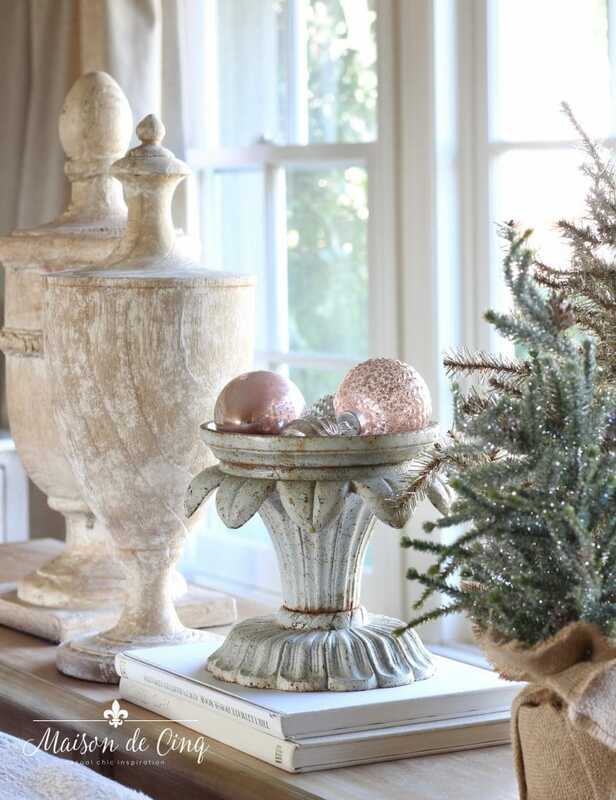 A little vignette on the sofa table has some urns, an antique garden ornament holding more pink ornaments, and two little trees. Hudson wanted to be in the shot apparently! I couldn’t get him to leave, haha! 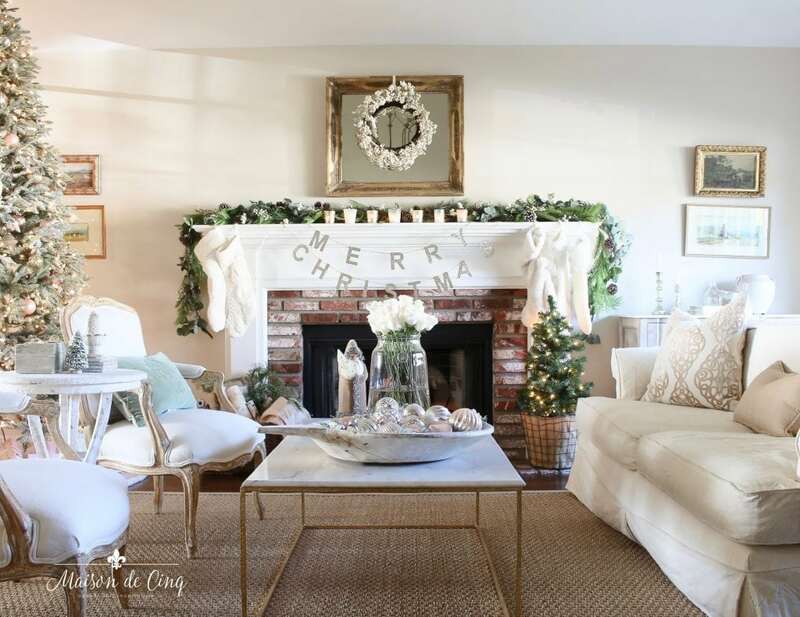 I hope you enjoyed my Romantic Christmas Living Room! 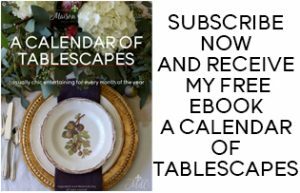 I’ll be sharing more tours in the coming weeks, as well as another Christmas tablescape this week so stay tuned for those, too! To see all of their trees, go here. All the other sources in the post can be found below! 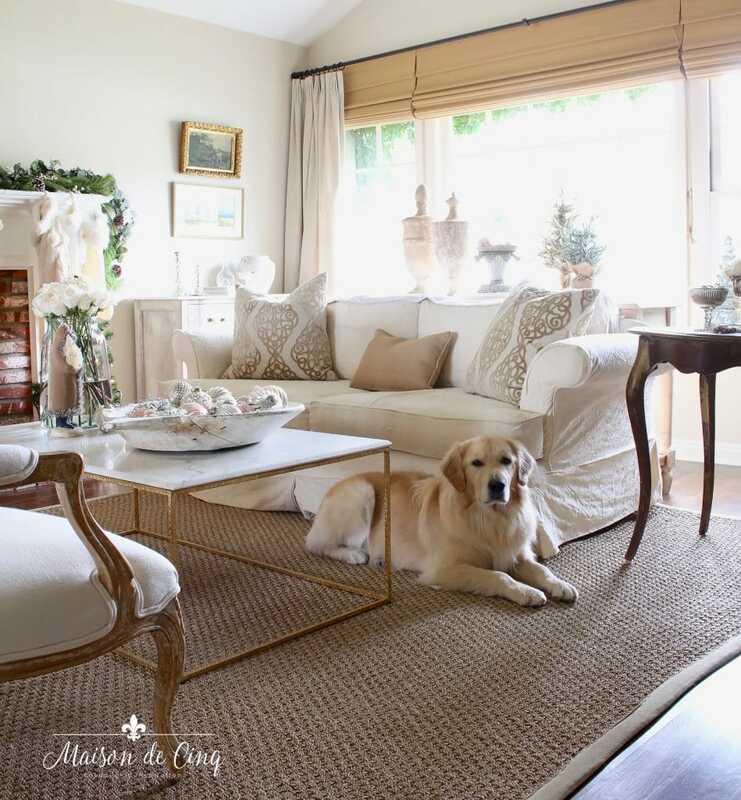 Be sure to check out the rest of the fabulous bloggers sharing their Balsam Hill trees this weekend! Looks beautiful! 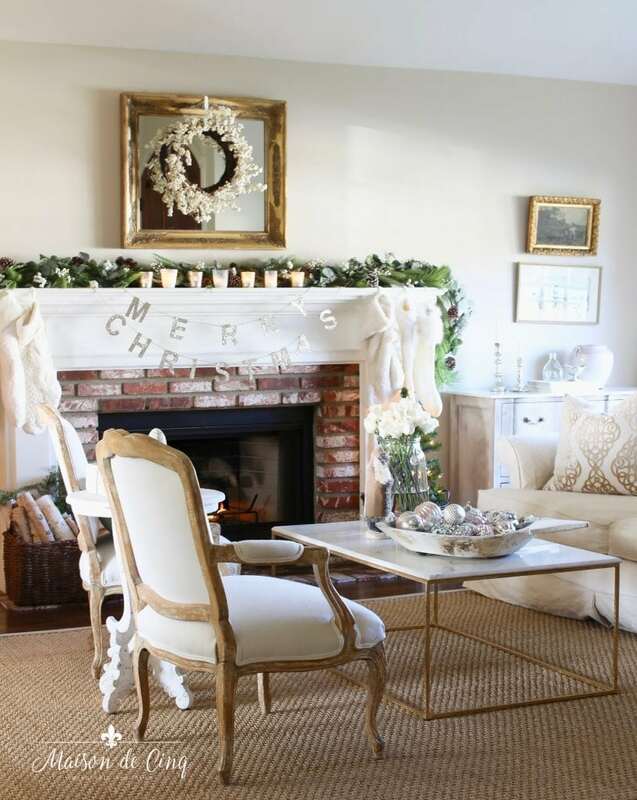 Love the glass vase with the flowers on the coffee table. Would you be kind to share when can it be purchased? Thanks. Hi Indiana, and thanks so much for your comment! The glass vase is linked in the “Shop the Post” at the bottom of the post, in the second row. Mine is the largest size of the three. Hope that helps! 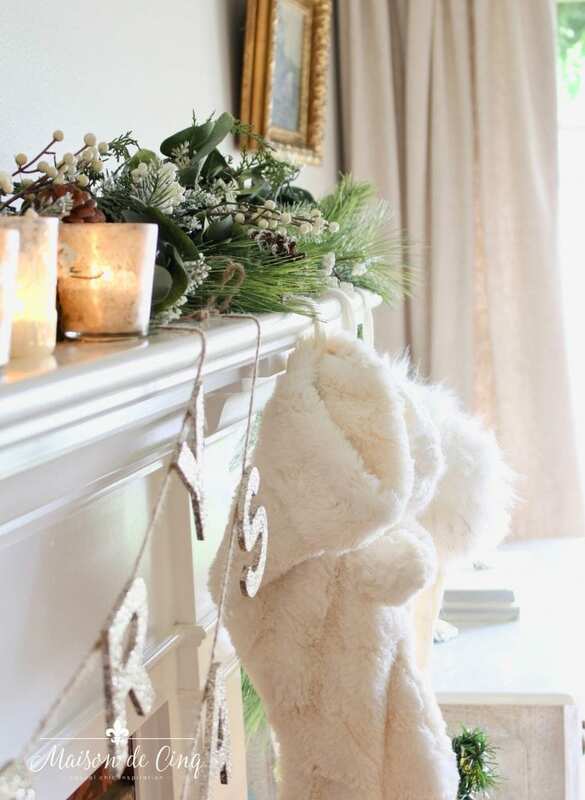 Your Christmas décor is gorgeous! The soft pink adds that little something extra! 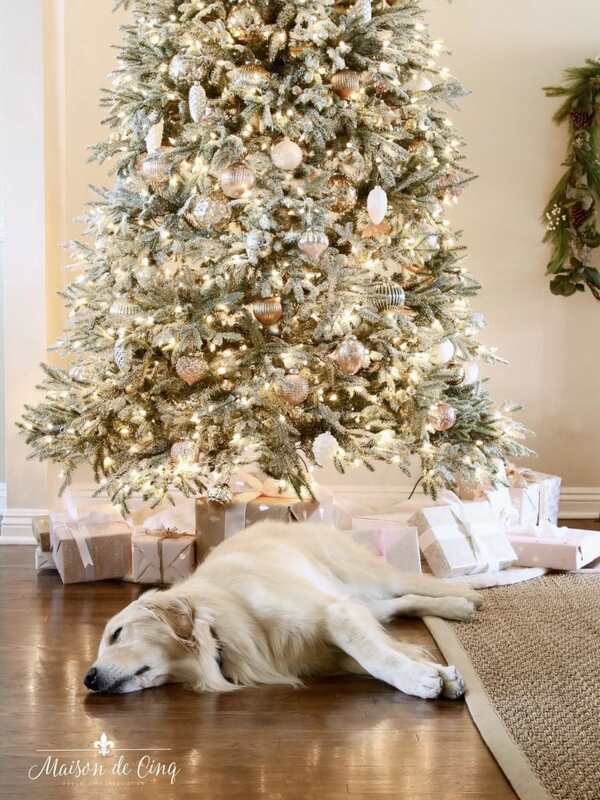 I have never had a flocked tree but this dreamy tree of yours makes me want to try one. I love all the beautiful wrapping paper you chose. 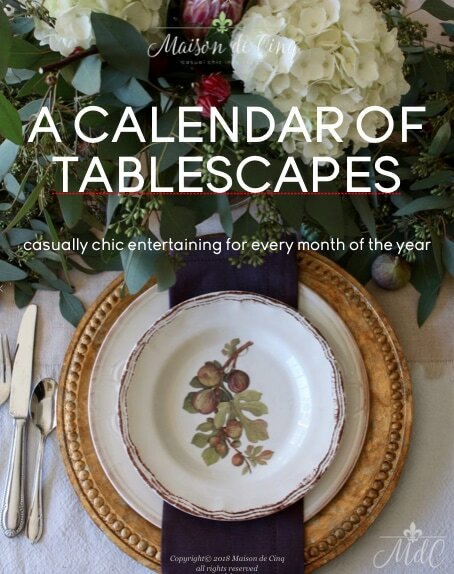 The idea of being able to use it for other occasions other than Christmas is a great idea! Merry Christmas to you & yours! Thank you for stopping by, and for taking the time to comment! Aww thank you Courtney – that means so much coming from you as you know I adore anything Christmas that you do! THANK YOU again for including me, I feel so honored to be with all of you on this tour and I absolutely love my Balsam Hill tree! Sheila, your tree is spectacular! I love the size and the overall fullness. Your colors are gorgeous again this year and your darling Hudson is the perfect “accessory”! Such a doll. Enjoy your week!